On Saturday morning my friend Greg and I headed out to the Cedar Mountain Youths pistol match. I was looking forward to a quick morning of enjoyable shooting in a low-pressure match, with a fun group of people. And that's what I had. This month's match seemed to focus on getting the shooters into some less-than-comfortable shooting positions. On the first stage, there were three targets to be engaged; first while standing, then by dropping down to shoot through a low barrel while kneeling. Stage 2 was shot leaning around both sides of a barricade, with a mandatory reload in the middle. Stage 3 was a bit of a memory stage. Two shooting boxes were set out, with eight targets to be engaged, some of which were strategically placed behind barrels so they could only be seen from one or the other position. The next stage was a habit breaker, with four targets and four shooting areas. You had to shoot all four targets, with just one shot each, from each of the four positions. I saw several shooters put two shots on a target from the same spot (and earning penalties.) I had to catch myself several times from firing off that second shot. Stage 5 put our flexibility to the test again, as well as our shooting skill. Three groups of three targets were to be engaged from three somewhat awkward positions. The first position required kneeling to shoot under a barrier while leaning around the left side of a wall, then moving to shoot though an exceeding small low port, and finally another kneeling position from the right side of the wall. The final course of fire was another stage requiring shooting three different target arrays while moving between three shooting boxes. The first array had two targets, one with partial hard cover. The center array consisted of four simulated steel plates represented by paper plates. The final array paired a close in, wide open target with a more distant, head shot-only target. The stage was a challenging combination of targets that required different focus and speed. The match was, simply put, a lot of fun. The varied stages were good representations of individual bits and pieces one might encounter at larger sanctioned matches, but on a smaller scale. Getting new shooters interested in practical pistol shooting is one of the benefits of the Cedar Mountain matches. There's no pressure and the courses of fire are challenging, without being intimidating. Besides new shooters, there are folks that just want a chance to do something a little more exciting than what's possible at a "square range." 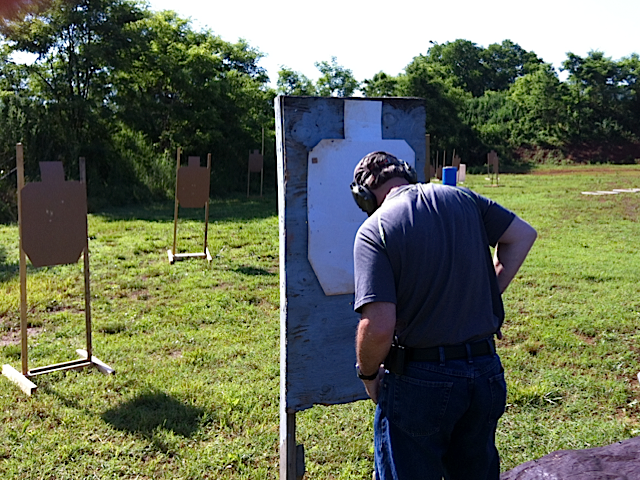 Experienced USPSA shooters can get in some fun practice time too. I always get a kick out of a new shooter experiencing practical shooting competition for the first time. This was Greg's second time trying his hand at practical pistol shooting. On the drive out we talked about kids and college; on the drive home we talked about guns and USPSA Divisions. I think he's hooked.